An electronic journal for the members of a Book Club in Ottawa, ON Canada. Hi all. We met at Shirley's last night and were treated to wonderful hors d'oeuvres and a strawberry dessert, all in an African ambiance in honour of the book. Thanks for going the extra mile yet again, Shirley! 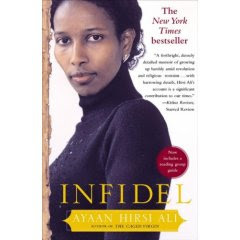 We discussed Infidel by Ayaan Hirsi Ali, Shirley's choice at the recommendation of Linda's boss. Shirley gave us some background on the author. Ms. Ali apparently speaks 6 languages, has also written Caged Virgin, and has won numerous awards. Her life is still in danger as a result of her anti-Islamic stance and her speaking out against violence against women. A website with more information is http://www.aei.org/ (American Enterprise Institute for Public Policy Research in Washington, D.C.). Shirley also recommends that we view a 10-minute movie, made with Theo VanGogh, who was later murdered for his work. See http://www.youtube.com/ to view Submission: Part One. Shirley points out that the tone of voice in the movie is totally wrong. All the ladies found the book great, and the discussion was long and lively. Beth pointed out that the theme is "It is not tolerant to tolerate intolerance." Carla thought the read so compelling that she even went on to read the Quran, which she found revealing and inconsistent. Some of the ladies were uncomfortable and confused by the book, since it didn't mesh well with their experience of Muslims in everyday life. In fairness, Ali does not suggest that all Muslims are violent--some are quite progressive. We talked about the Arabization (sp?) of Islam as part of the problem, and felt that silence on matters of violence is tantamount to being an accomplice to injustice. In essence, we all feel that as Canadians, so comfortable with tolerance of minorities, it is still important that citizens adhere to the laws of the land. The issues should not be seen as racial and cultural, but as a part and parcel of living in a liberal democracy. I really enjoyed this book. I did google the author and saw the vitriolic hatred against her by many in the Muslim community. For those interested in the larger political issues, I recommend Madeleine Albright’s book, The Mighty and the Almighty. She was the Secretary of State for Foreign Affairs in the Clinton government in the US . She argues cogently that it is very important to support moderate Muslims in order to bring and maintain global peace. Moderate Muslims are often threatened by extremists. But there are many forms of Islam, like there are many forms of Christianity. All comments are reviewed before being published. The Book Club will begin its 21th year of existence in January 2019. We are nine members and we meet the 4th Monday of every month from September to June, excluding December. There is still one member from the original group in 1998! Each member of the club has the opportunity to recommend a book and host the meetings of the club. There is no particular theme for this club so we have read a great variety of books.